In the San Francisco area, beta testing of the Google Guarantee program has been launched for some service providers and contractors. The idea is that Google wants to show consumers the best results. And by “best” they mean legit. 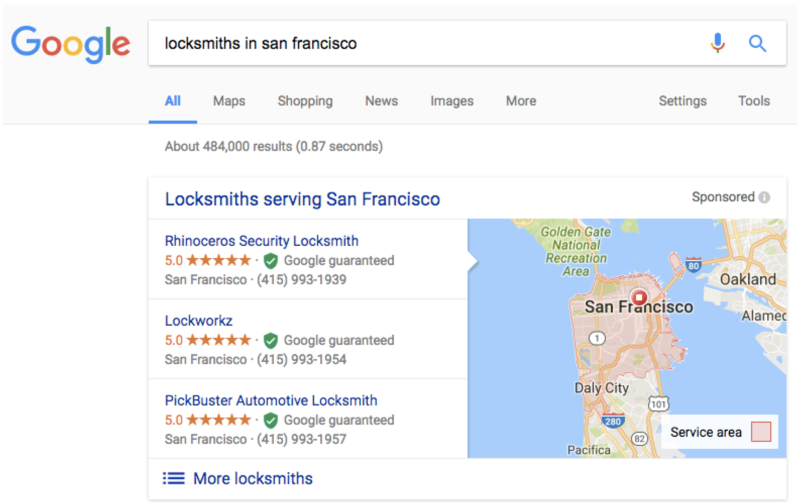 Towards the end of 2016 it was reported that locksmiths and plumbers in San Francisco were scamming homeowners with AdWords ads and Google My Business listings. Unsuspecting folks who simply needed help getting back into their house or fixing a leak were subjected to the misuse of Google SEO best practices that directed them to call, what they thought, were low cost solutions to their problem. • After being locked out of one’s home and not knowing what to do, a quick Google search brings up a list of local locksmiths. • Google returns AdWords ads and Google My Business listings for locksmiths promising cheap or inexpensive service rates. • Calling one of these bargain locksmiths actually routes you to an offshore call center, where they dispatch someone local to come to your door. • The locksmith shows up and, before trying any other options, immediately drills the lock open and slaps you with a large bill for the service. • The cheap service you thought you were getting then turns into a large expense. • Congratulations, you can now get back into your home but you’ve become a victim of locksmith fraud. This new development from Google will eventually affect other verticals, including healthcare providers. Independent practices that want to stay at the top of search results should be prepared for this change because they can no longer rely on simply paying enough for AdWords ads to attract patients. Doctors will continue to need strong, relevant organic content AND compliance with Google Guarantee requirements. For consumers or professional service providers, here’s how you get a Google Guarantee. 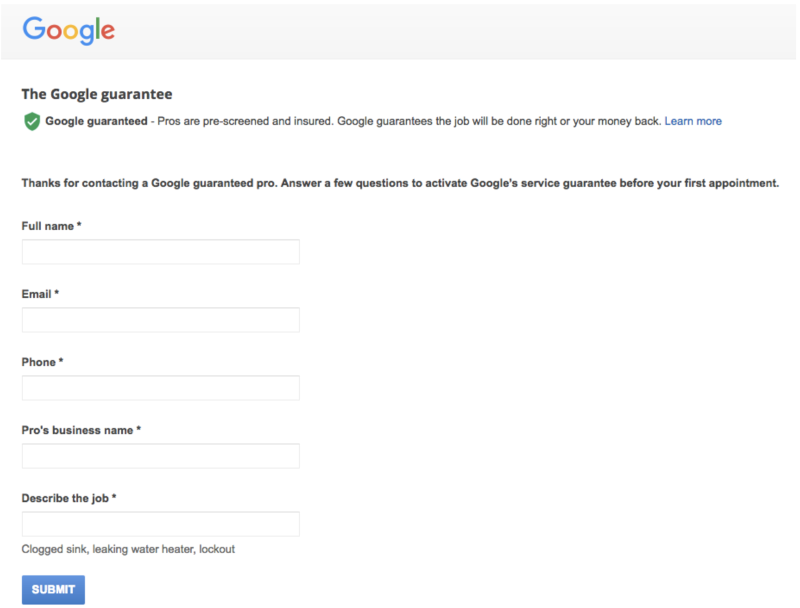 Consumers need to fill out this Google Guarantee form before their first appointment with a business, to activate the guarantee. Then, if there’s a problem with the work being performed, the consumer has to submit a claim with Google’s customer support at (844) 885-0761. • Jobs booked through Home Services only, not including additional (add-on) projects, property damage, price disputes, provider responsiveness or cancellations. Google uses the famous, and at times in their 160 year history, infamous, risk management and security company, Pinkerton Consulting and Investigations, Inc.
Google then checks to make sure you have the proper licenses and insurance coverage. That’s followed by a look at your online reputation. As part of the guaranteed pros program, Google collects ratings and reviews from your customers which will impact your ranking if you receive too much negative feedback. Will Google Guarantee Become a Direct Competitor to the Angie’s Lists of the Review World? Angie’s List might be the most well known resources on the internet for user reviews of local businesses. And if you want to see to those reviews you have to pay to play. As of June 2016 there is a free membership option available, with paid tiers above that. A business can list themselves for free, but in order to actually show up on Angie’s list you’ll need to have a lot of organic reviews, or you’ll have to pay to advertise. Angie’s List faces some of the same criticism that other review sites (like Yelp!) face, such as the way that they handle negative reviews from users and honesty about their advertising revenue sources. So now we have Google stepping in to verify the legitimacy of contractors and service providers and offering consumers a guarantee. As a consumer, you never have to leave the friendly confines of Google for an independent website offering another version of that same peace of mind. Google wants to provide you a proprietary experience offering you Google maps, email, search, reviews, a Google phone (Pixel), and more all under one umbrella so that you never to rely on anyone else. The Google Guarantee will certainly have an impact on online reviews which are growing more important all the time. We’ll likely see some impacts to the review industry as well, which will be interesting since Angie’s List and others pay to advertise on Google. 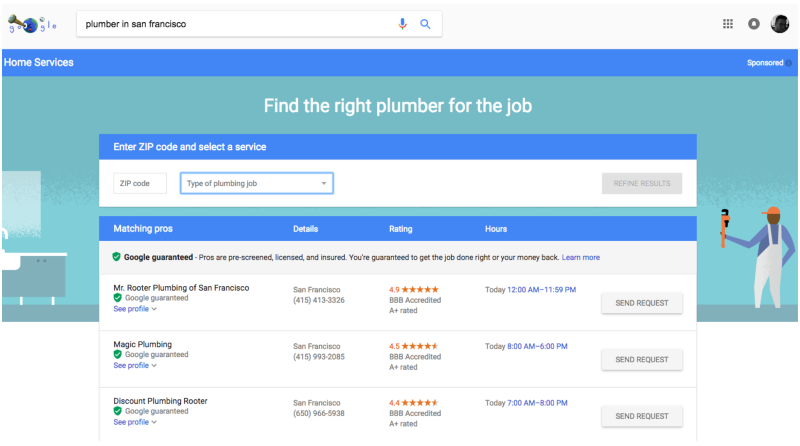 So far, the first foray for the Google Guarantee has been a few contractor verticals (plumbing, locksmiths) in one region. Stay tuned, it’s coming to other industries in a town near you. Oh, You’re An SEO Expert? How Did You Come Up With That Title!